In the village, there are about 10 charmingly restored houses. A few of these are used to provide accommodation for the workshop holidays. The idea is that all participants stay in the same house. Most houses have bedrooms for two or three people, some with a private bathroom, some with a shared one. Some have double beds, whilst others have two or tree single beds, so let us know your requirements in advance: if you are a couple or friends, for example, who don’t mind sharing a bed. Most will share bedrooms, but private single rooms can be provided with the payment of supplement. In this case, we will try to accommodate you in the same house but, if this is not possible, you will be accommodated in one of the other houses in the village. If you would like to remain in Cérvoles after the workshop, let us know! A number or options are available for extending your stay. Also, if you would like to book one of the houses as a holiday destination (without doing a workshop), please contact us and we’ll be pleased to help! Casa Pep is a beautifully restored barn with a stunning fusion of modern and old architecture. There is a big garden, several terraces and a natural swimming pool. Inside, it features two living rooms and two kitchens. There are five bedrooms, two with private bathrooms, and a further bathroom. 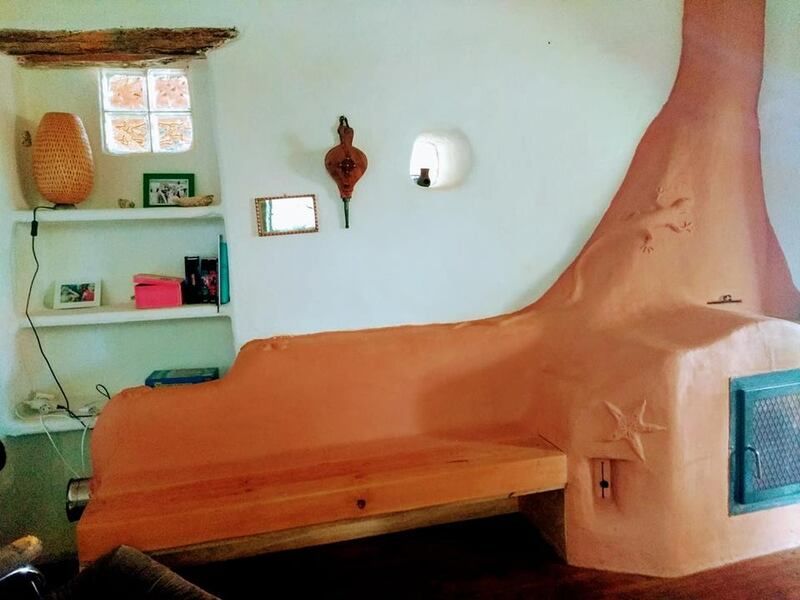 When you book Casa Pep, please let us know which room you would prefer, as the rooms are all quite different in size and some have a private bathroom. The rooms are booked on first come, first served basis: the earlier you book, the wider the choice. * Taller Room: a spacious room with view and a double bed (ideal for a couple or two close friends) or two singles, and a private bathroom. *Room with a view: double bed with a private bathroom and stunning views (ideal for a couple or two friends). * Mezzanine room: a smaller room with two single beds. * Ático Room: one double bed or two or three single beds. * Open room: one double or two single beds. Please note that this room is on a mezzanine of the living room and is not closed off, and will be available at a discount of 50 euro pp for the whole stay. It can only be booked if all the other rooms in the house are all taken. A beautiful house restored in a 100% sustainable way: very spacious and bright living room and bedrooms featuring lots of huge windows with amazing views! Four private twin bedrooms and two bathrooms. Tasteful decoration with lots of charming little details. Surrounded by small gardens. Here, bedrooms can’t be chosen in advance. If you request a private room, we will try to accommodate you in the same house. If this is not possible, we will accommodate you in another house in the village. A beautiful restored village house: spacious and bright living room, two bathrooms, two fully enclosed bedrooms and two further bedrooms that are semi-open (closed off by a curtain-see photos). All bedrooms sleep two or three, depending upon final numbers. La Era is a charmingly restored barn built around a central courtyard, the perfect venue for all kinds of activities; there is also a garden with amazing views. On the ground floor there is an open kitchen, dining room and a cozy corner for relaxing in; upstairs there are 2 bathrooms and 3 bedrooms; two bedrooms that sleep 2, one bedroom that sleeps 4 (in two bunk beds). Two additional beds can be added.